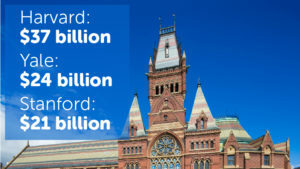 If you’ve been to any of my investment presentations, you’ve heard me talk about the fact that billion-dollar university endowments like those run by Yale, Harvard, and Stanford (aka, some of the smartest people on the planet!) have moved heavily into non-traditional investments for their portfolio asset allocation. These massive endowments, led largely by alumni-headed committees with carefully-measured objectives (such as healthy, stable, long-term returns that will support the institution for generations to come), are turning to non-traditionals for the same reasons we tout are also good for mainstream investors — reasons like diversification, consistent returns, and low volatility. It has been shown that the endowments with a larger exposure in non-traditional investments outperform their peers, and for good reason. Some of the smartest people on the planet are investing billions of dollars in alternative or non-traditional assets — and for good reason. When it comes to traditional investments, the information age has pretty much leveled the playing field. As far as assets like stocks, bonds, and mutual funds, everyone has access to the same information. So, how do you get an advantage over others who are buying the same Apple stock that you are? You don’t. And not only that, but it can sometimes be illegal to find ways to gain the upper hand. You could place your trust in a professional mutual fund manager to pick the right stocks, but fund managers are essentially playing the same guessing game that you are. In fact, a study performed by Nobel Laureates Eugene Fama and Kenneth French found that index funds (a low-cost, passive form of fund management constructed to match or track the components of a market index) outperform actively-managed funds by 97%. You read that right: 97%! That’s how efficient the traditional market is with its information. You might have a better chance randomly picking stocks. Mainstream investors are entirely at the mercy of the stock market as it takes your portfolio up and down on a wild ride. Non-traditional or alternative investments function in a completely different way. They are not efficient by any means! They are messy, hard to value, illiquid, and sometimes considered chaotic. That doesn’t sound very reassuring, but this is where those of us who have the experience can outsmart or outmaneuver our competitors in the market. For us, investments labeled “messy,” “hard to value,” and “illiquid” are the ones that allow us to gain the greatest competitive advantage. There are really only a select few who can do the same in the traditional realm or stock market. Does the messy, chaotic nature of non-traditional investments make them risky? No! But, as with any investment, you must choose wisely. The wrong non-traditional investment models can be very risky, while the right ones can be far safer than traditional investments. Since Guardian can’t handle a cool billion-dollar investment, I doubt that the big endowments will be knocking down our door anytime soon. However, the value and profitability concept of non-traditional investments is the same whether large or small — and usually, smaller is safer: we can be patient and wait for the right deals that pass underwriting rather than be forced to deploy major amounts of capital. It’s not new for endowments to invest in non-traditional assets, but it isn’t the norm yet, either. The following press release, written by Cambridge Associates, shows how endowments that invest in non-traditional assets outperform their peers over multiple decades of historical returns — basically mirroring the findings of French and Fama’s study on index funds. (Although the study was performed years ago, the findings still hold true today, since only about 30% of the financial market has caught up with the idea of using low-cost index funds to invest.) This isn’t the most approachable read, but if you stick with it, I think you’ll find it to be very insightful. No matter how you slice your portfolio, the evidence proves that non-traditional investments should make up a healthy piece of the pie. BOSTON (July 26, 2016) – The gap between top performing endowment portfolios and the median has been wide of late, and a key indicator of better performance is a 15% or greater allocation to private investments like venture capital, private equity and distressed assets. That’s according to research among a universe of 453 university, college and foundation endowments by investment advisor Cambridge Associates. The research, published in a new Cambridge report, “The 15% Frontier,” finds that endowment portfolios with more than 15% allocated to private investments have outperformed their peers consistently, and for decades. For the 2015 fiscal year, ended June 30, 2015, the MSCI World Index, which tracks the performances of large- and mid-cap companies across 23 developed countries, returned -0.32%. For the same period, the median return of the endowment universe was stronger: 1.3%. And if one looked only at endowments with 15% or more of their assets in private investments, the median return was much better, 3.6%, for fiscal year 2015. “Not only did institutions with more than 15% in private investments outperform over the past five and 10 years, but they also outperformed by similar margins over the past 15- and 20-year periods. In fact, over the 20-year period, endowments with over 15% allocated to privates outperformed those with less than 5% in privates by a cumulative margin of 182 percentage points, or 180 basis points per year,” said Walton. For the 10 years ended June 30, 2015, venture capital, private equity and distressed securities were the three best performing asset classes, with annualized returns of 12.6%, 11.4% and 10.4% respectively, each outperforming the equity and bond markets on an equivalent basis. 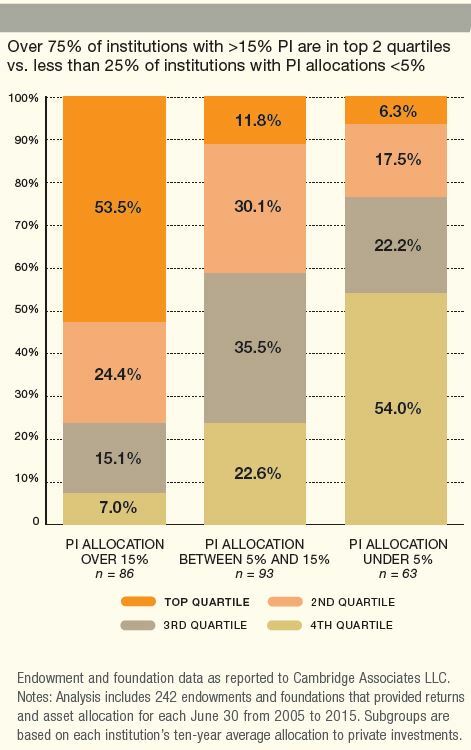 Given that, it’s not surprising that the top-performing quartile of endowments had, in the same timeframe, an average private investment allocation of 24.1%, while the bottom quartile only had a 6% allocation, according to the paper. “It’s important to note that the group of endowments with more than 15% in private investments is no longer limited to a handful of very large universities and foundations. For the 2015 fiscal year, almost 40% the report’s endowment universe, 174 institutions, reaped the benefits of this larger private investment allocation,” said Walton. “The three main concerns institutions express about adding private investments at a level that might boost returns are a concern about illiquidity, which is a component of long-term commitments to private investments; the belief that private investments can only be made successfully by large institutions with the scale and resources to build a diversified program; and the sense that few investors can access the limited group of top-tier private investment funds essential to a successful program,” Walton said. “These concerns are certainly understandable – but they are often over-stated. We believe they do not, for most institutions, preclude a private investment allocation of 15% or more,” Walton added. While the report says every institution with an endowment needs to be certain that the liquidity in its portfolio is adequate for all likely cash flow needs, it also points out that many institutions place a value on liquidity that exceeds actual cash needs, even in worst-case scenarios. “Many institutions may find that a higher private investment allocation is well within their tolerance for illiquidity,” Walton said. When it comes to concerns about endowment size, the report points out that a number of the outperforming endowments in the report’s universe – those with 15% or more in private – are relatively small. Of the 174 in the 2015 top-performing group, 48 have assets below $500 million, including 26 below $250 million. “And the view that private investing requires access to a very small group of tightly closed top-tier firms is a somewhat dated view of the private investment industry. As it has grown and developed, new and developing venture capital funds have frequently appeared at the top of the lists of vintage year returns, often outperforming established funds,” said Walton. To read the full 15% Frontier research report, click here.